This is the last series of quilts for the project. They are enclosed in a piece of lightly inked canvas. The image was printed on iron-on inkjet printable fabric. I didn’t need to but I stitched it down with some variegated thread. I am so happy to have completed this self imposed creative assignment. 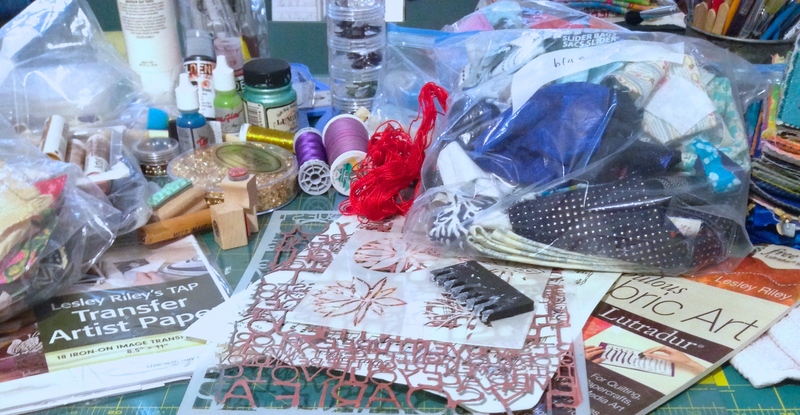 I learned many things along the way and got to use some supplies that were just languishing in my studio. 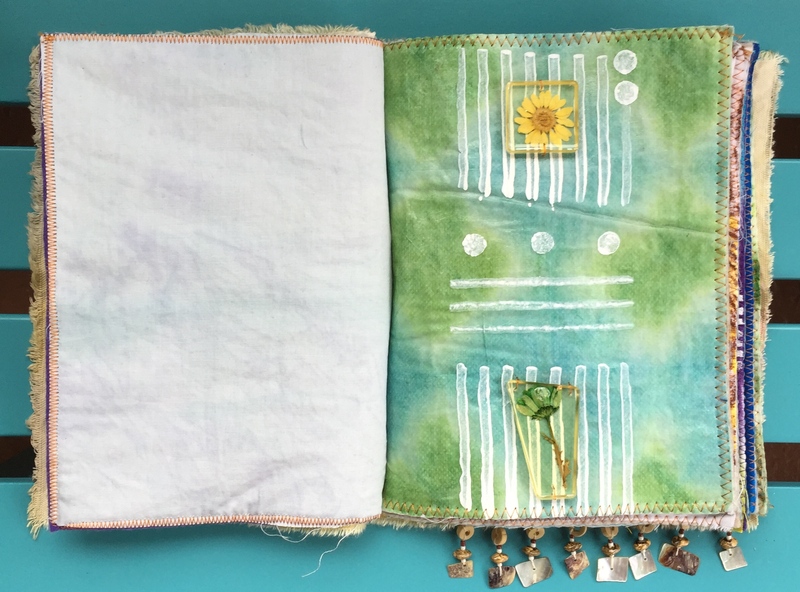 I used fabric glue and attached eight of the mini quilts (including the cover which was the first quilt of the series) to a strip of canvas in order to create the first journal. I had to cut the quilt that I used for the cover to size and redo the edges with the zig zag stitch. These two quilts are the last of the project. 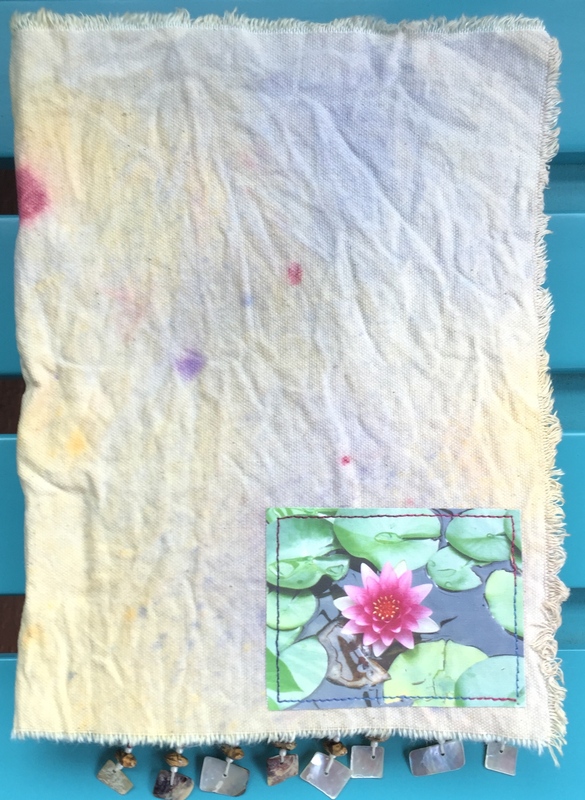 To create the sun printed quilt top, I spread the paint out on the muslin with the sponge, making sure the muslin was highly saturated. It was a nice sunny day so I put the fabric outside on the grass and placed the metal number and the keys on top. When it was fully dry I removed the objects and added the felt batting. 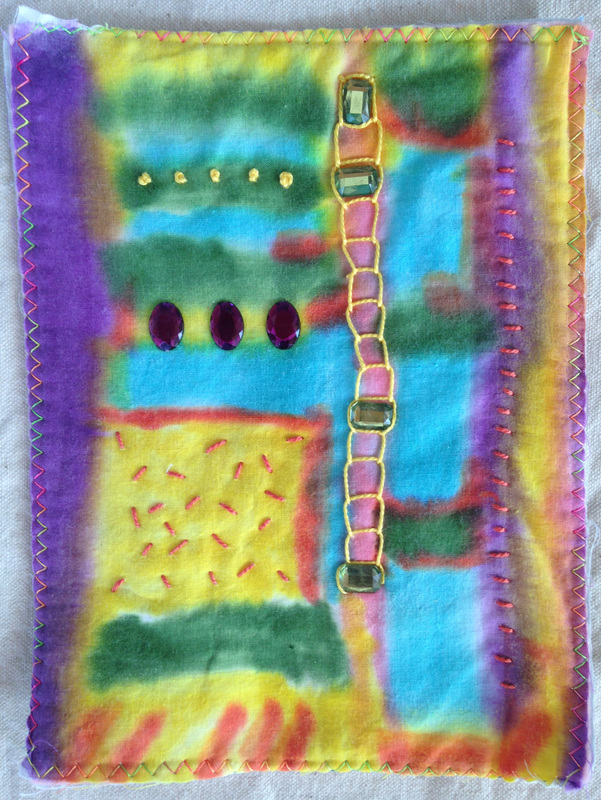 I thread painted inside the little openings within the object’s shapes then hand stitched the stones onto the quilt. Added the cotton fabric backing. Tip: Metallic thread is iffy when machine stitching. I used a metallic needle and the thread still broke intermittently. Stitching slowly helps. After randomly tying the rubber bands around the tightly squeezed muslin, I put the fabric in a plastic container and squeezed out paint on top of it, purposely leaving some white spaces. I squished it with gloved hands to work the paint in and left it to dry overnight. Somehow the green took over but the tie-dye effect was a success. 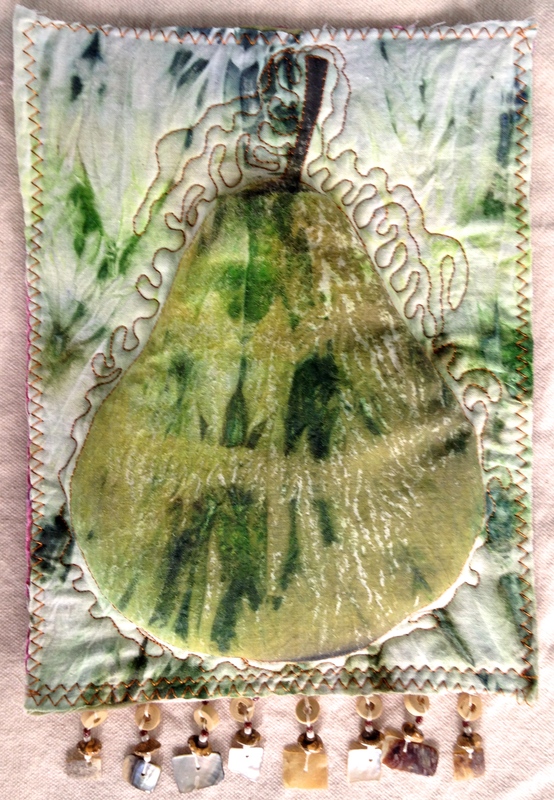 The pear image was printed on Artist’s Transfer Paper, cut out and then ironed onto the quilt top. The fiberfil batting was put under the pear shape and I stitched an outline around it to create the trapunto effect. I then trimmed of the excess fiberfil and made the quilt sandwich. I free motion stitched around the pear to bring out the puffiness. The trim was added to the bottom. Tips: Although many paints nowadays are non-toxic, if your hands are going to be dabbling in a lot of paint, as a precaution it may be best to wear gloves. Regarding, trapunto, it is best done using polyester batting. It creates more dimension than cotton batting. I taped the CD (folded the tape unto itself and put it under the CD) to the top of a glass sheet to create a mask. I spread out the paint on the sheet and placed the muslin on top of it to creat a monoprint. 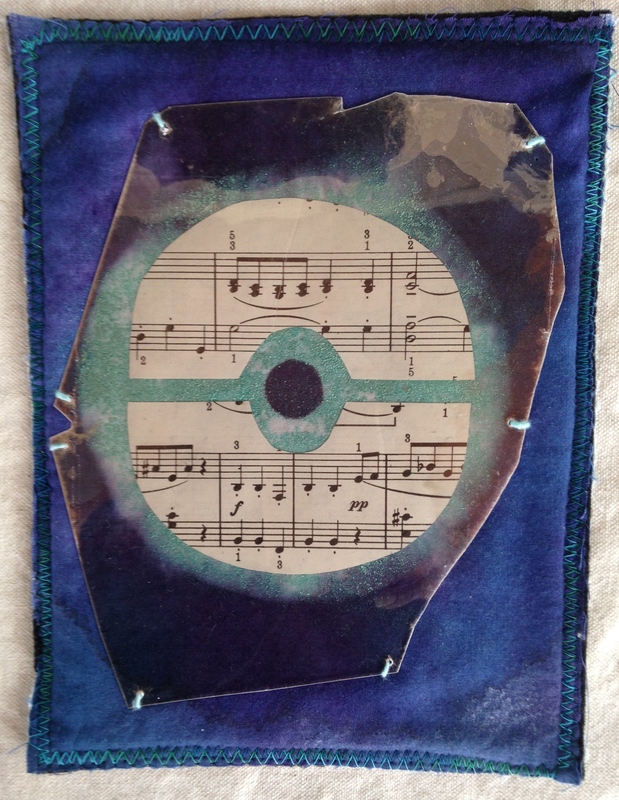 After carefully removing the fabric, I then removed the CD, painted it and laid it on top of the circular white spaces that the mask left on the muslin; cut out and glued the music scraps to the painted CD spaces using the matte medium as glue. Some water accidently spilled on the quilt top and made a tiny discoloration on the dark blue background so I decided to spray on a little more water. Hence the batik look of the background. 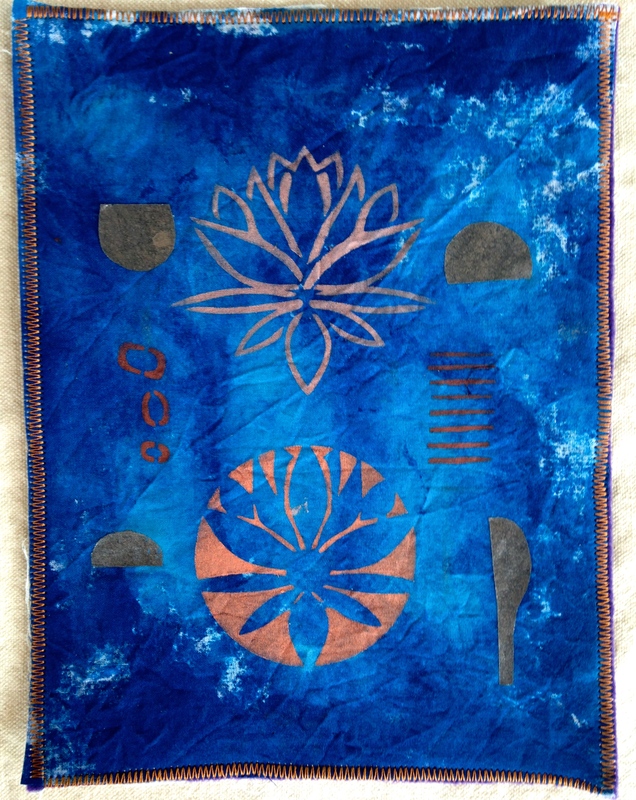 The quilt top was placed onto the felt batting. I made holes in the mica using a very sharp, pointy clay tool to allow for stitching. I hand stitched the mica onto the quilt top and then carefully machine stitched the quilt top and batting to the cotton fabric backing. Tips: Mica is fragile. Be sure and use a light hand when working with it. It’s a great material for protecting delicate papers. I prepped the muslin for dyeing with vinegar and water, boiled the burdock root in water and drained it to get a deep rich coloring. I dipped the muslin and simmered it for over an hour. Well, the results were less than stellar. It was much too pale. No more burdock for me. I should have used blueberries or red cabbage. To reach some type of acceptable hue, I put the fabric back in the pot, added some coffee grounds and let it sit on a very low simmer for an hour. After rinsing, a nice soft beige was achieved. The over-dye job was more successful. I put some diluted yellow paint in a plastic container and scrunched the black and white fabric down in it. I made sure to leave a little of the original fabric undipped to show the contrast. I flicked some black dots on top of the already painted canvas scraps using a toothbrush, to meet the “painting” requirement on the list. Placed the pieces of over-dyed fabric with it’s 505 sprayed, haphazardly arranged canvas scraps on the muslin background. Added some free motion stitching and assembled the quilt. 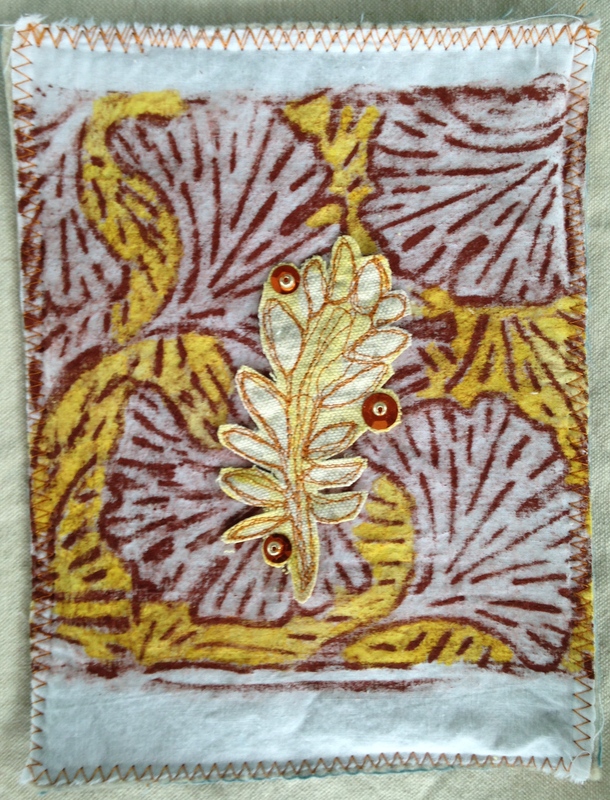 Tips: Use perseverance when dyeing with natural materials. It can be difficult to get a rich, vibrant coloring. Also, be scrap happy. Save small scraps. They come in handy for a myriad of projects. The fluid acrylic was mixed with a small dollop fabric paint medium then spread on top of the muslin leaving some of the fabric’s original white color visible. 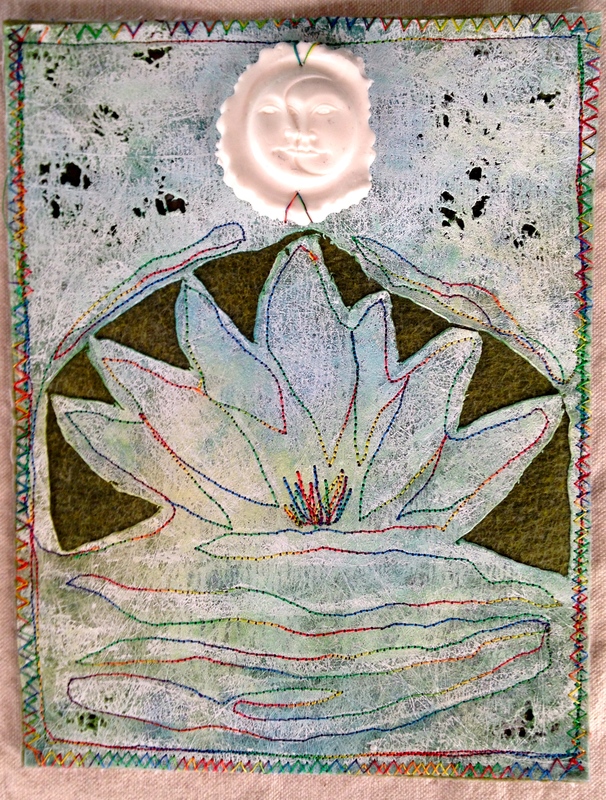 After it dried I stenciled on the lotus and abstract shapes using paintstiks a stencil brush. I had previously painted a scrap of fusible web and cut out some abstract shapes. 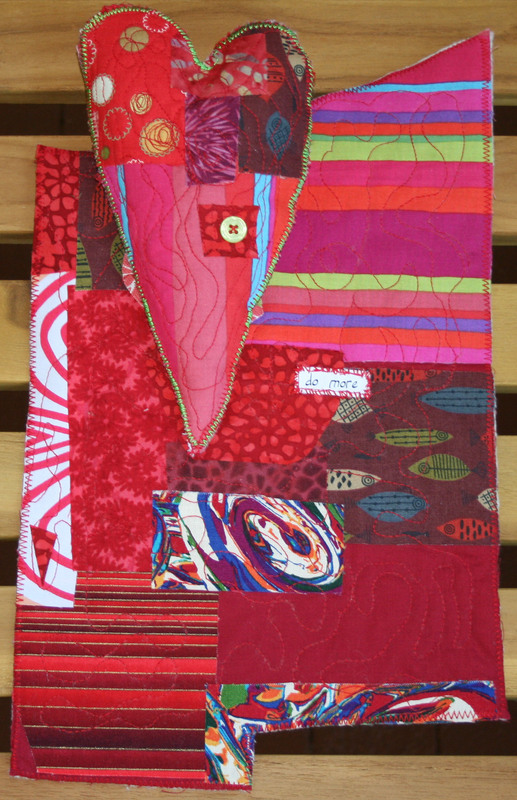 The shapes were ironed onto the quilt top, the top was added to the felt and backing. Tips: Don’t let unusual color combos scare you. I discovered that I love the uniqueness of blues and dark brown together. Regarding fusible web, if you decide to iron on painted fusible, don’t leave the iron sitting on it too long. I did that and it darkened the paint and took away the original glittery look of the paint. The fabric paper quilt top was made by saturating muslin with diluted Elmer’s glue then topping it with strips of tissue paper and cheesecloth. I ripped and randomly placed both the paper and cheesecloth in a way that allowed some of the paper to show through. Unpatterned placement in art tends to add interest and texture. 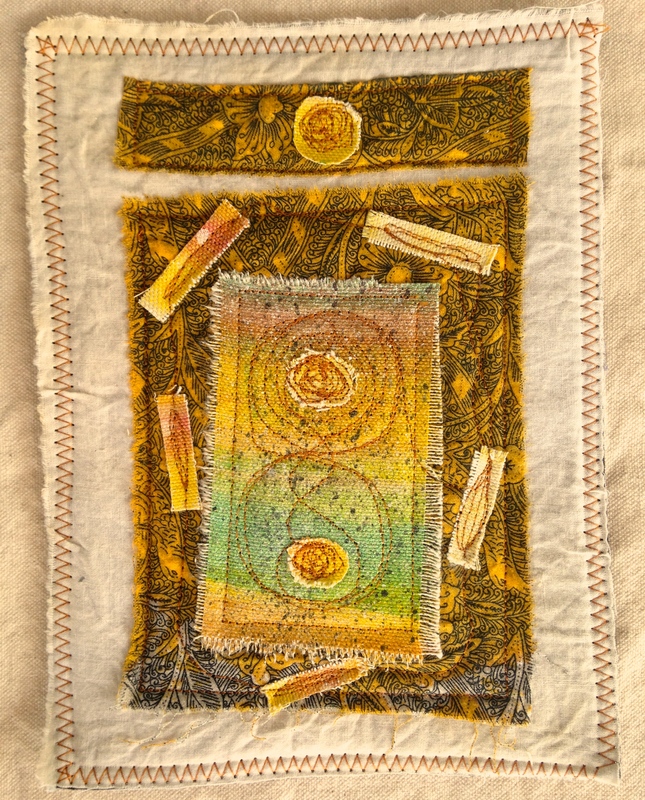 After it dried, I made the quilt sandwich and free-motion stitched for additional texture and color. The dress is canvas that was colored with foil using foil glue and a bone folder to rub it on. The dress was outlined with a dark green sharpie to give it some dimension. 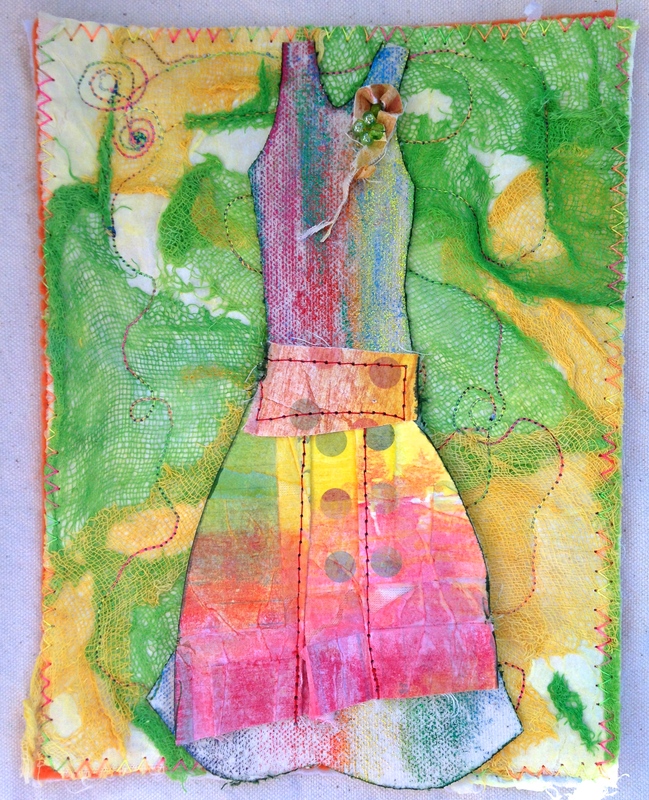 I manipulated fabric paper scraps I had in my scrap bag and made the pin and apron. Making the pleats in the apron and the gathers in the pin was not an easy feat. The paper tore but I didn’t mind at all. In fact, it turned out to be a happy accident because of the textured look it created. I’m into texture, wonky and messy. Can you tell? But I digress. The apron was machine stitched to the dress. 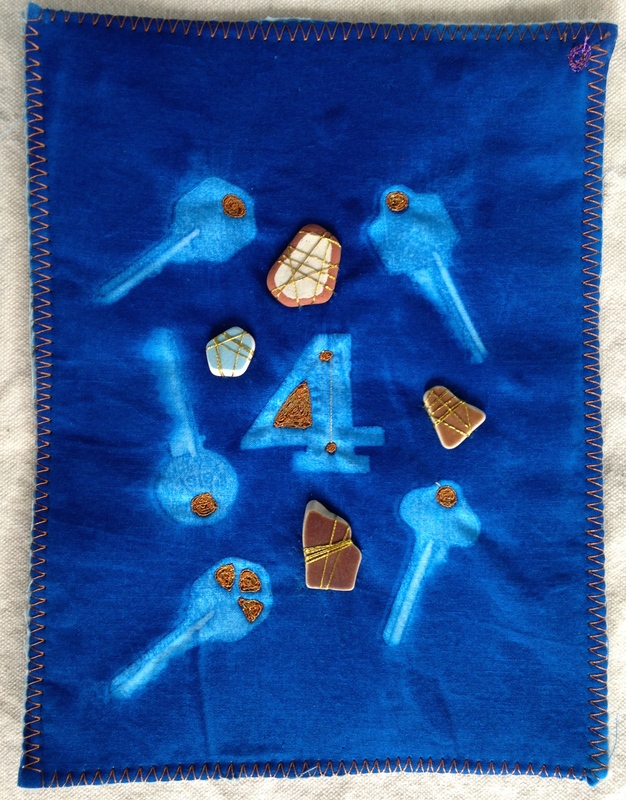 The fabric paper pin and glass beads were hand stitched on. The last step was gluing the dress to the background using fabric glue. Tip: Outlining an element or motif with a dark or contrasting color can really add dimension and interest. If you find your piece is looking flat or washed out, trying outlining. 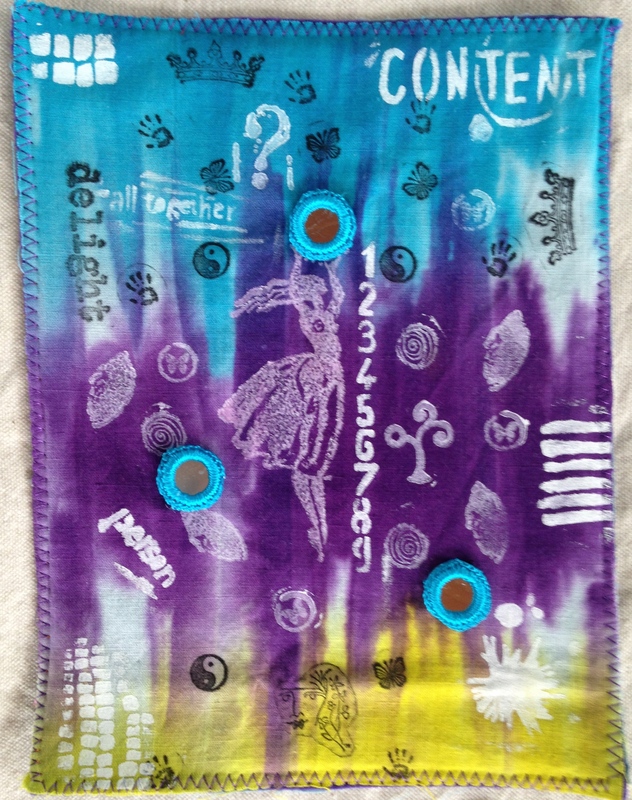 After covering the Gelli plate with paint using a brayer, I placed the text stencil on top of it then carefully laid the muslin on top. The same was done for the heart and bands of color. 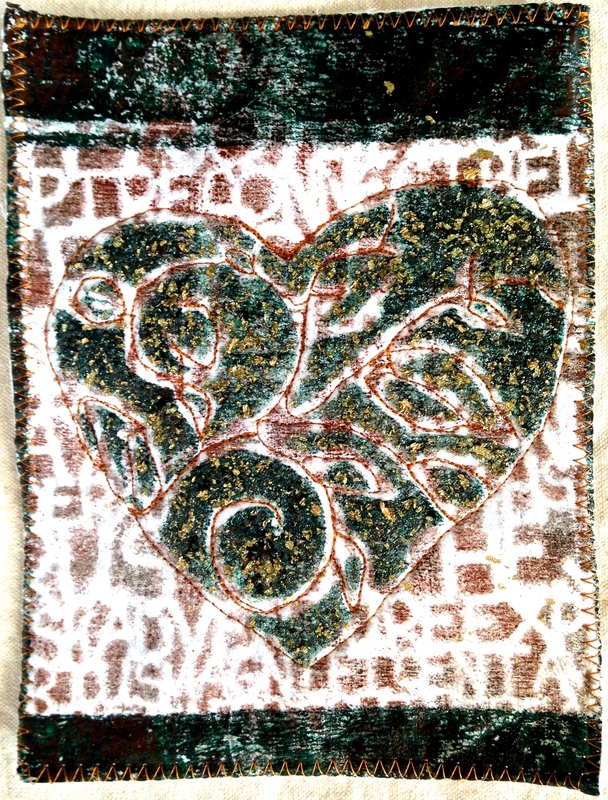 I placed the heart stencil back over the initial heart print and stenciled on coarse molding paste that I mixed with gold leaf flecks using a palette knife. 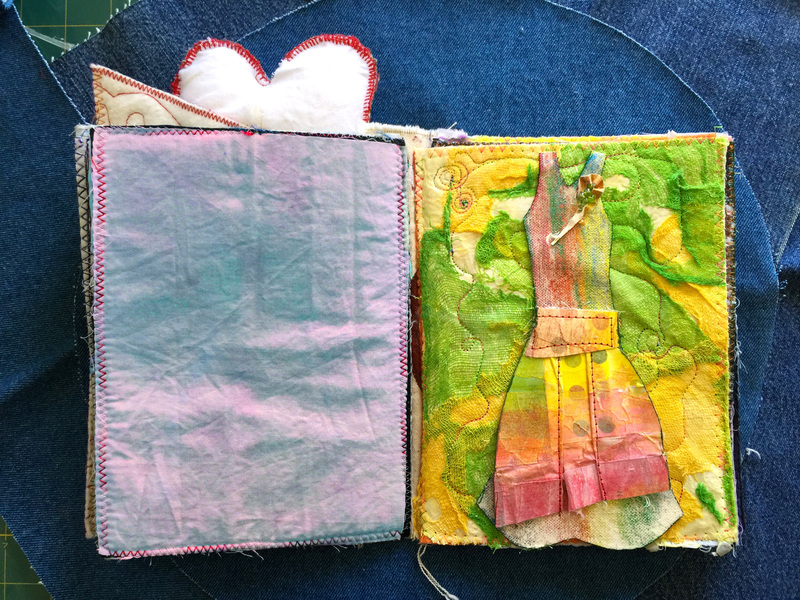 After everything dried, I made the quilt sandwich and free-motion quilted the heart. Tip: Gold leaf flecks tend to float around a lot. They are beautiful but not all that easy to work with. Work slowly and deliberately with the medium. The little girl who used to love her new box of crayons and coloring book resurfaced within me when I began this sampler. The markers took on a life on their own and I just began drawing shapes, filling up with muslin with color. I sprayed it with alcohol which causes the inks to bleed and merge into each other. The fumes were pretty strong. The smell eventually dissipated as it dried. The muslin was put on top of the felt batting and I added the embroidery. The jewels were glued on and the quilt was assembled. Tips: Use gloves and protective eye glasses when working with alcohol. Also, work in a well ventilated space. Quilt number 1, 3D applique quilt “do more“ was actually made before I decided to use a combination of three methods on one piece. I’m going to use it as the cover for the first of two art quilt journals. Here is a link with some background information on how this project metamorphosed. 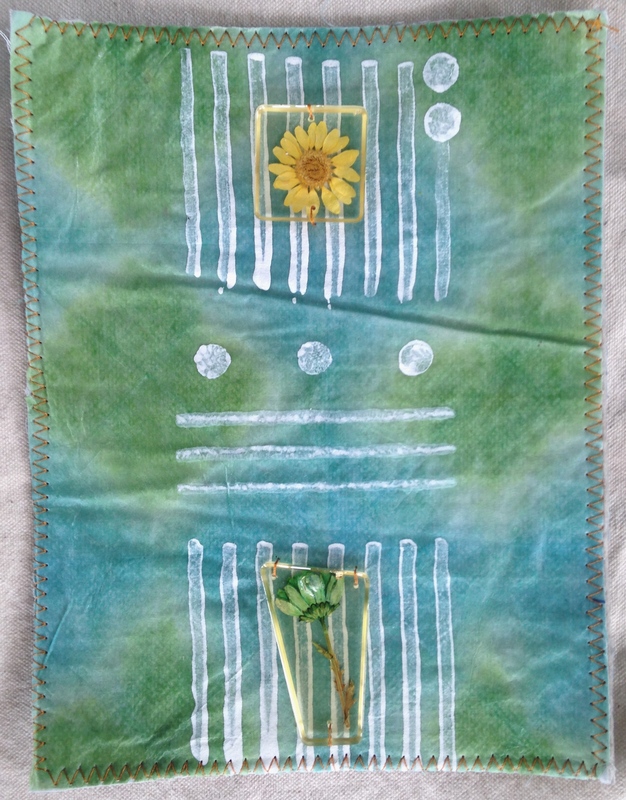 The quilt top is painted batting stamped with a wood block dabbed with acrylic paint. 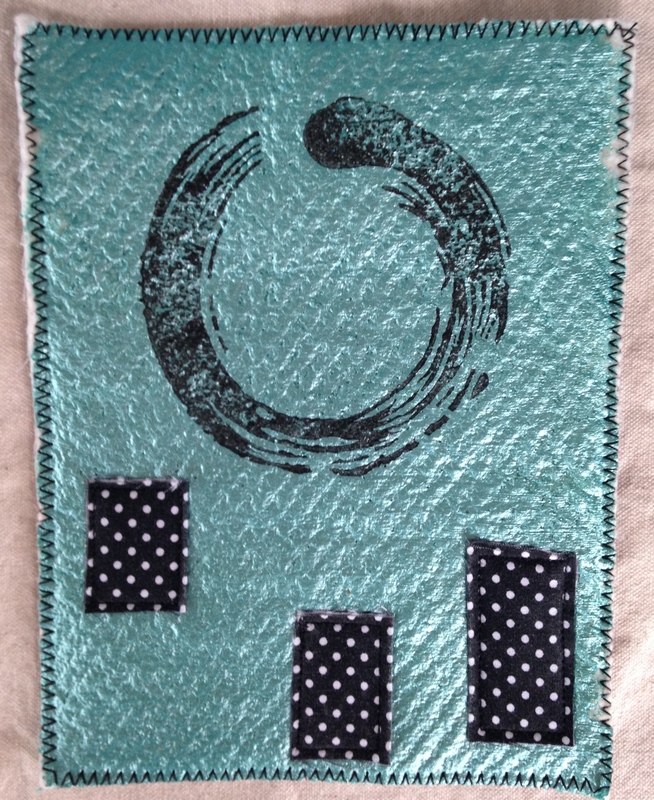 Three little rectangle scrap appliques were unevenly placed to give a sense of movement. It’s actually only two layers, batting and backing so I’m not sure if it’s technically a quilt. I cheated a little there. Tips: When using a wood block with a fast drying acrylic paint, push down firmly on the block but only hold it down for a few seconds so that it doesn’t get stuck to the surface. The paint should be cleaned off of the block as soon as possible using a mild soap and warm water. The quilt top is lutradur and was painted with a light wash of colors. Placed on top of a gesso filled collagraphy plate. After it dried, I put the Lutradur on a sheet of glass and cut out the triangular shapes around the lily using the Versa Tool. Placed it on top of the felt batting and free motion stitched along the faint lines of the design created with the plate. If I had used thicker cardboard, the glued down shapes would have produced a more prominent design and it would have been easier to trace with the stitching — or perhaps if I had added some rich color to the gesso, that may have made a difference as well. The heat gun created the lacy holes in the Lutradur and the felt. I held it about 8-12 inches away from the fabric and kept it moving in a circular random type motion. I assembled the quilt before hand stitching the clay moon face on the top. In retrospect, I should have added the clay piece before adding the backing. All hand stitched embellishment work should be done before the quilt sandwich is assembled so that the stitches are hidden under the backing unless the preference is for the stitching to actually show. Tips: When using any heat tool or any mediums, use proper ventilation and/or a mask as a safety precaution. Use all safety measures at all times. I don’t recommend using the heat tools that I used for this piece on cotton — it will just burn. Synthetic materials work best for me. About Modena Air Dry Polymer Clay — it is fantastic to work with! Just make sure there are no little dust particles around your work area. The clay seems to be attracted to dusties. I traced the pear design onto the fabric. Made little surrounding circles with the Devore to create holes so the black felt batting would show. Removed the Devore melted fabric with a wet toothbrush. Ironed the quilt top until it was dry. Placed the top over the batting and doodled on some accenting pen work. I added embellishments by stitching on some beadwork and embroidering a few x’s on the stem. The backing fabric was added. Tips: Use a lightbox to trace a design onto the fabric if the fabric is not sheer enough to see through or if you would rather not draw on your own. 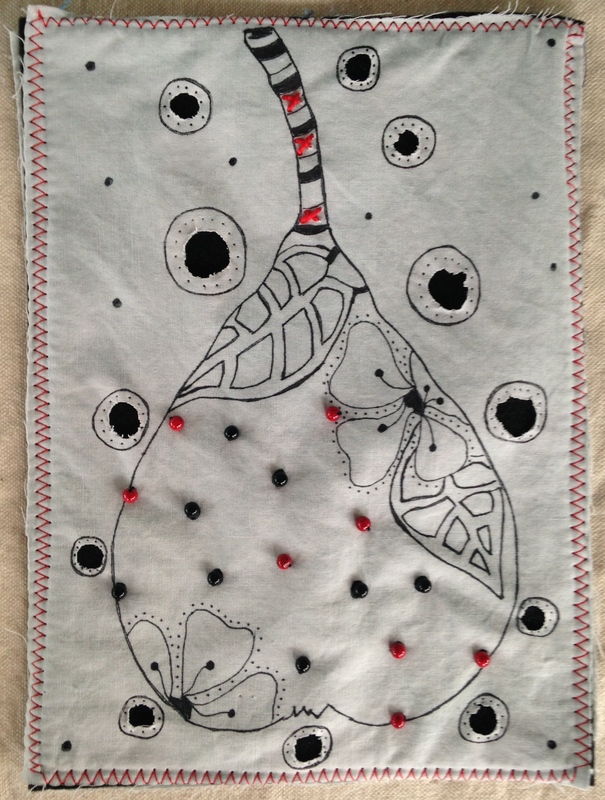 I used the sun by placing the fabric up on the window and tracing for most of the pear. It was not easy. I might invest in a lightbox. Also, if using Devore, follow the directions to the letter. The project is finally complete. Time surely flies when life happens. I made fourteen sample mini art quilts in addition to the initial 3D applique technique quilt. Each one is 6″x 8″ and has three techniques and/or elements from the list except for the last one which has four. They are all bound with a zig zag stitch, have raw edges and a cotton fabric backing. Any applique work was also done with raw edges. Here a is link to how the project changed from it’s original intent. 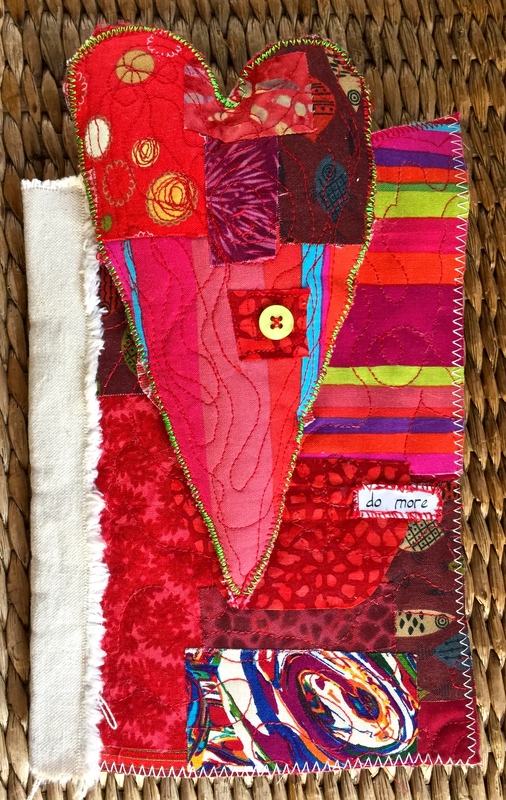 I will post them in a series of three quilts at a time and include a list of the supplies I used, a summary of each piece, and some tips for anyone who might want to try a little mixed-media. This exercise was so much fun but it was challenging at times. I learned a lot about what works for me and what doesn’t. For instance, I will probably never do fabric manipulation using fabric paper ever again. The paper was too stiff and difficult to work with. The results of spraying alcohol on fabric in order to create a marker bleeding effect was not worth the fumes. I also learned some new techniques that I absolutely love and will incorporate again and again in my pieces. Low loft batting looks amazing painted and sealing tea bag paper with polymer medium yields a cool leathery look. Playing with unfamiliar materials is a great way to experiment and ease out of your comfort zone as an artist. Sometimes we can get bogged down in repetition using only the supplies we’re used to and get stuck in a creative rut. Perhaps I would have never uncovered any of the useful lessons I learned had I stayed in my little artistic cove of fear — afraid to open my bottles and jars which were moving closer and closer to their expiration dates — standing there wondering about my mysterious unopened packages of colorful painting tools. I finally, bravely ventured out. One of the greatest things an artist can do. A mish mash of some of the supplies I used.